Research & Education Association, 9780738603131, 416pp. CLEP(R) is the most popular credit-by-examination program in the country, accepted by more than 2,900 colleges and universities. For over 15 years, REA has helped students pass CLEP(R) exams and earn college credit while reducing their tuition costs. Our CLEP(R) test preps are perfect for adults returning to college (or attending for the first time), military service members, high-school graduates looking to earn college credit, or home-schooled students with knowledge that can translate into college credit. 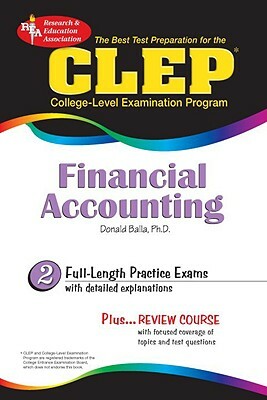 The CLEP(R) Financial Accounting test prep assesses the skills tested on the official CLEP(R) exam. Our comprehensive review chapters cover: accounting principles and ethics; forms of business and cycles; the income statement; the balance sheet; statement of cash flows; investments; contingent liabilities, and more. REA is the acknowledged leader in CLEP(R) preparation, with the most extensive library of CLEP(R) titles available. Our test preps for CLEP(R) exams help you earn college credit, save on tuition, and get a college degree.